Finished framing in the storage room . 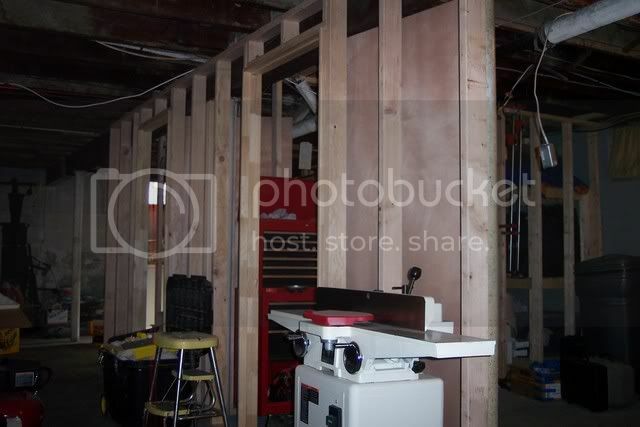 and started on one of the shop walls. That glass block window on my fancy OSB assemby table is a replacement for the laundry room. Shop cat refused to get out of the picture. Here’s the mess that it will be replacing. 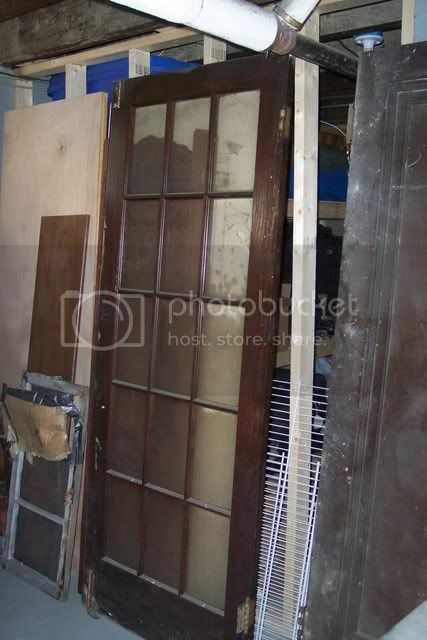 Here’s the other half of my French Door that someone thought would make a good table. 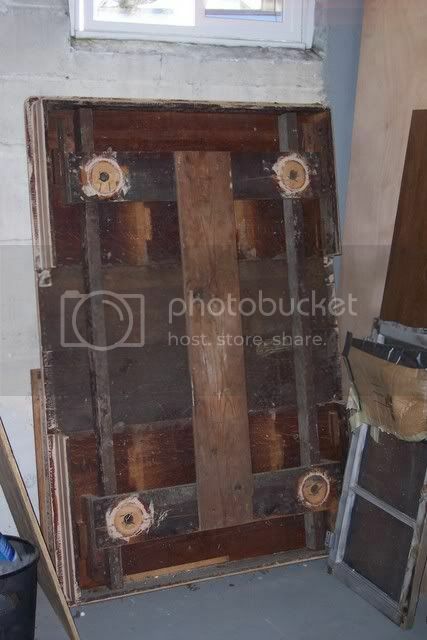 Going to try and hang some sheet rock this weekend. You’re moving on. Good luck. Lots of work done so far. It is coming along nicely. OK…Time to turn on the brainstorm guys! First I see that you’re gonna track sawdust all thru the rec area everytime you go to the bathroom. You being married may complicate this. Second, That real nice picnic table that you built will prove to be a real struggle if you had to get it out of the new shop. (There’s a corner staircase.) In other words, you are limited as to just how big a project you can go. Third, you need to supply a fresh air vent to your boiler…from the outdoors! That bendable dryer ducting works well for this. 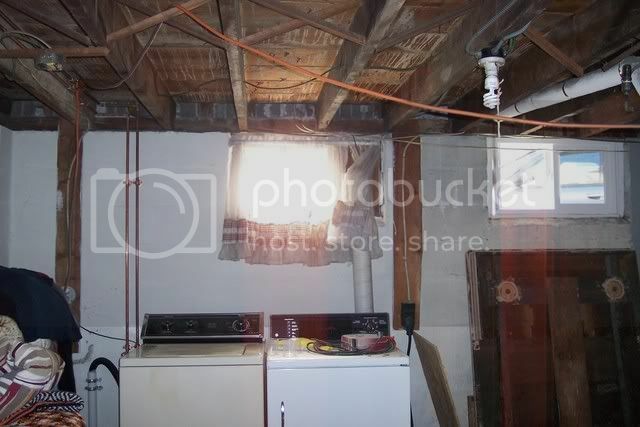 Here’s another consideration…Heating the basement. Looks like you already heat the house with hot water and registers…Now will be a good time to gut the first floors heat plumbing and install a radiant floor system. 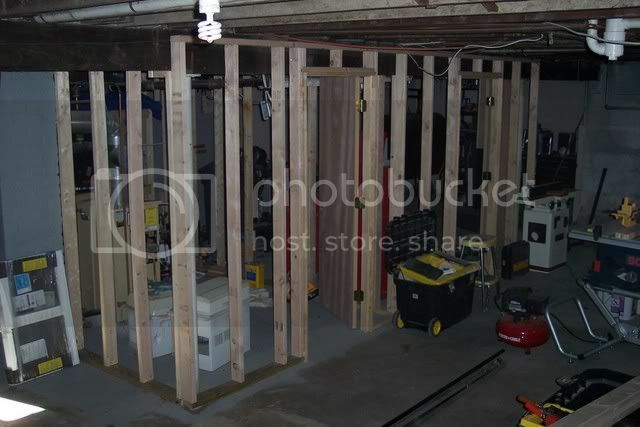 Then take the scrap registers and plumb them into your basement areas, on a different zone. It’s really not that hard of a job and would take about a week to do yourself. And then there’s the shop office. Where are you doing that right now? Computers are just not fine dust friendly at all. I’d keep the planning room upstairs near the ‘fridge and coffee pot! I’d be tending to move the office wall about 3 more feet south and use that new space for say, a dust free finishing room! God! I wish I had this sites options when I designed my house! Dadoo – Tracking the mess, tools, lumber, and finished projects through the family room came up when we first started contemplating the layout and we just accepted it as a necessary evil. The choices as we saw them were walk through the family room to get to the shop or walk through the shop to to get to the family room. Getting projects out as well as stuff in has always been a challange and a limitation at this house, it’s one of the reasons I don’t own a band saw anymore. But that will change once we finish this house, the next house is going to have an out building for the shop! 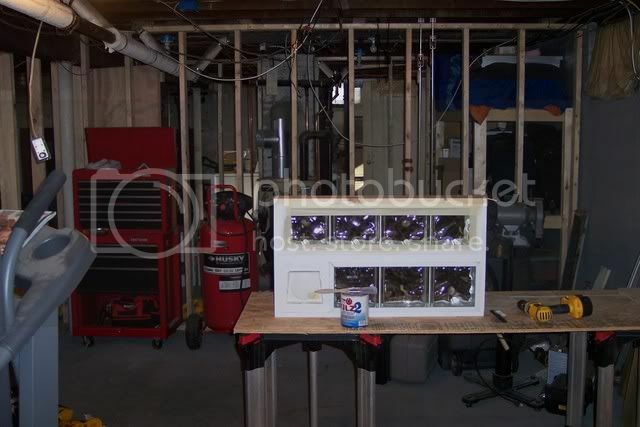 I fantasize about that frequently ;) until then I’m forced to incude getting the project out of the house as part of the project planning, larger stuff like that table either gets constructed so it comes apart easily or final assembly happens in the garage. Not my preference but it’s what I’ve got to work with for now. Got the boiler ventilation covered using indoor air. For rooms less than 7,200 cu ft/GPH input provide 2 openings (one within 12 inches of the ceiling and one within 12 inches of the floor) from an adequately ventilted area to provide 140 sq in per 1 GPH input (1 sq in per 1000 BTU). Combustion air from an outdoor vent requires 35 sq in/GPH input (1 sq in/4000 BTU). I’d need a little more than 57 sq in strictly using outdoor air. 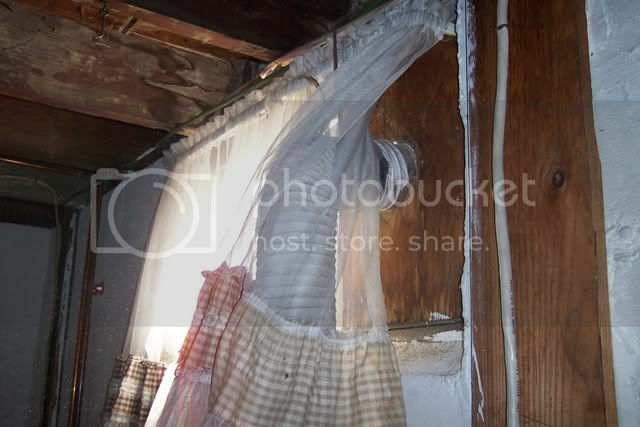 A typical 4 inch dryer vent get’s you about 12 sq in so I’d need 5 of them. I love the radiant floor idea! But, that’s a low pressure steam system, not forced hot water. The boiler was the only new thing in the house when we bought it so converting now just ain’t gonna happen. Heat dowstairs is either going to be electric or a pellet stove. We’re leaning toward pellet stove. The office is upstairs now in an existing 10’x12’ room that is going to become an 8’x12’ walk in closet after we expand the bathroom. That finising room was part of the original vision back before reality set in lol. I’m going to end up giving up shop floor and putting a wall between the office and the shop. But that’s OK, this set up only has to get me through the next 2-3 years. First allow me to apologize for raining on your parade! Thats’s what brainstorming is about. None of it is intended to be demeaning. Looks though like you’ve got the bases covered. If you’re using low pressure steam, couldn’t you add a new basement zone? Around here it’s rare to find anyone heating with steam anymore. So although I’m familiar with hot water heating I’m figuring that your steam system operates on the same principal. Also looks like this isn’t your only home project! Good luck with the rest! And keep the photos comin as it’s fun watching it take shape. I really enjoy hearing the thoughts behind a project. Thanks for sharing your layout planning with us. Dadoo – not sure what you are applogizing for my friend? I went back and read your previous comments again and, try as I might, I couldn’t find one thing in there that I might have taken as demeaning. The point behind me posting this stuff is to hear the ideas, input, and opinions of others. Looks to me like that’s exactly what you did so if anything I should be saying “Thanks” not you saying “Sorry”. The low pressure steam isn’t all that uncommon in this neck of the woods. Although it’s not my favorite it does have it’s benefits. There are a couple of different ways to set them up, in this house we’ve got whats called “single pipe, gravity return”. One of the benefits is that there are no pumps and the system pressure is never more that a couple of PSI so you really have to have a gaping hole in the system somewhere before leaks start to be a problem. The downside to this is that since there are no pumps and essentially no pressure, the condensate in the system has to get back to the boiler via gravity. The boiler heats the water generating steam. As the system pressurizes, vents on each of the registers will open and allows air in the system to escape as it is displaced by steam on it’s way to the registers. Once the demand for heat is satisifed the boiler shuts down, steam inside the registers/pipes condenses and the condensate travels back to the boiler down the same pipe it took to get to the register. That’s ovely simplified but essentially how it works. Since it’s a gravity return, all of the registers have to be above the boiler and all of the pipes have to be pitched back to the boiler. If you end up with a situation where the pipes are configured such that they could trap water then anthing past that point in the pipe will eventally stop heating as the trapped water will prevent the steam from passing that point. There is such a thing as low pressure steam with a pumped return where you can install registers level with the boiler providing that you can locate the condensate reservoir/tranfer pump at a point that is lower than the lowest register. One more thing…... THANKS for your comments. You are welcome and thanx for your returns! I see I’m gonna have to add you to my buddy list! We actually took a 150 mile trip just to see one of these in action. It was very nice and I really liked the fact that it was also different! But it was also expensive…So I built in a propane fireplace! At least it’s 100% efficient! When you want heat you turn it on, and when you don’t, you shut it off! And the other nice thing is that you can heat the house when the power is out! 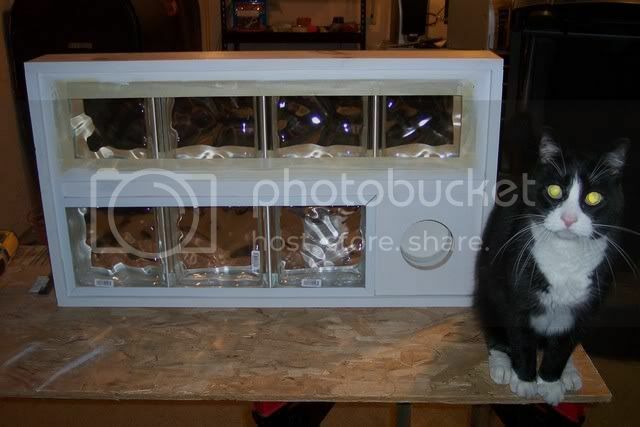 So anyhow, if you want to see a different type of pellet stove go hit that link. I honestly never thought of propane as an alternative. I always assumed that those gas fire places were for looks. I didn’t realize they generated enough BTU’s to actually heat the place. I gotta check local building codes and see what I’ve gotta do to get a big enough propane tank in my yard to make it practicle. So how big a tank does it take? We live in the city and our lot is about the size of a postage stamp. The houses here are packed in so tight that we actually share a driveway with our neighbors. The driveway literally straddles the property line, if either one of us put a fence up on it then neither one of us would have room to get out of our cars. Thank god they are decent folks. There is an upside to it though, there isn’t much snow to shovel after we pull all the cars out of the diveway ;) Anyway, we were thinking pellets over a wood burner simply because we really don’t have the room to stock pile logs. The furnace actually throws quite a bit of heat when it’s running and does a pretty fair job of keeping the basement warm. I’m just not covinced that it will be enough to keep things comfortable once we’re done with this little project. Rick’s boss bought a new house and rebuilt the fence between the driveways… the neighbour sold the house at the same time and the new owner complained loudly about the fence. (her rationale behind her complaint: I drive a Cadillac you know!) They brought in the surveyor and what do you know, the boss’ property was actually a foot closer to the neighbour’s home. They rebuilt the fence putting it on the property line (and raised it a couple feet higher). Shaun, Go surfing some of the gas fireplace sites like Comfortglow, etc. Also check out your local stove dealers. If they sell woodstoves, then they’ll probably deal in gas fireplaces too. I was checking out this one that we swear was a real fire with glowing embers and coals…it was propane! Here’s the kicker…The fireplaces run on either propane or natural gas. Don’t know what you got in Rhode Island. All you gotta really do is change the jets. Some of them need be vented out a simple chimney, some do not. Propane is clean burning (our gas range and clothes dryer burn it too.) so the exaust won’t kill ya. Natural gas exaust will put you to sleep. Permanently. That’s not good and will require a chimney. And the other thing to consider is that a lot of heat goes up a chimney. So only a “ventless propane” logset/stove will be 100% efficient. I’ve had ours cranked, heating an area of about 750 sq. feet and got it up to 85 degrees in here, and it was -20 below outside! And truthfully, it all depends on how you use it as to how much fuel you’ll burn. I picture that in your family room, it will see nightly TV time use and a 20lb tank would probably last you about a week at that rate. Oh, the new logsets have a thermostat built in and also come with a remote control! It’s worth checking out. And the wifey will really like it too! Debbie, that’s what we call “open mouth, insert foot”! LOL! I’m definitely going to look into the propane fireplace insert idea. We can keep the rest of the house cooler and just touch up the temp in the living room for a couple hours at nice. LMAO Ms Deb – that has got to be one of the best fence stories I’ve ever heard.I Love it! Dadoo – thanks for turning me on to the propane stoves. I’ve had a chance to look at a couple of them and I’m liking what I’m seeing. The couple that I’ve looked at so far all reccommend a minimum of a 100 lb bottle. Not sure why they say that but I’m still shopping.